A simple but effective way to give your web audiance a feel for an area or a location is to give them a guided tour. With a plan view of the area or location, they will be able to click on "hot spots" and be given the panoramic view from that actual place. 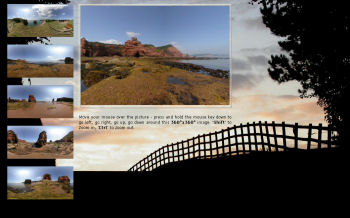 Or an armchair tour of Ladram Bay in Devon.